OnLive has formed a partnership with electronics manufacturer Vizio to incorporate its cloud gaming service into Vizio HDTVs, Blu-ray players and the forthcoming Via Tablet and Via Phone. The big promise of OnLive's cloud gaming system is access to high-end gaming without the need for expensive hardware and accessories. All you need is a good broadband connection and just about any halfway-decent PC and you're off to the races. 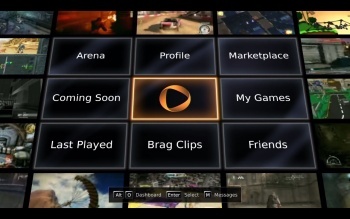 For those lacking even that, OnLive also offers a set-top "MicroConsole" for gameplay through your television. But if all goes according to plan, you soon won't even need that, as new hardware from Vizio including LCD televisions, Blu-ray players and Via Plus tablets and smartphones will include built-in OnLive capability. OnLive CEO Steve Perlman told Gamasutra that the nature of OnLive means that while the hardware will age and eventually slip into obsolescence, the gaming service is a big plus for televisions because it will continue to get better. "That is important for televisions, because they stick around longer than something like cell phones," he said. "You may keep them around for five, six or seven years." The Vizio brand may not have the cachet of Sony, Samsung or Panasonic, but it has made an impressive splash in the market since its launch in 2002. The company rang up $2.5 billion in sales in 2009 and holds a significant share of the LCD television market in the U.S., less than one percent behind first-place manufacturer Samsung over the first six months of 2010. And while that doesn't necessarily guarantee that this partnership will be a smashing success, the very nature of the deal at least takes the risk off the shoulders of consumers. Even if OnLive tanks, Vizio buyers still have their HDTV or Blu-ray player, while OnLive's existing distribution channels means gamers won't be left hanging if all falls apart. The new OnLive-enabled Vizio hardware will be demonstrated at the Consumer Electronics Show this week and will be released for sale later this year.